Lithium Corporation. (OTCMKTS:LTUM) has been steadily rising since mid-February on a few exciting developments. The stock has gained practically doubled and has been developing a long base over the last six months. The company recently has been entering into new agreements which could bode well for its future. LTUM share price closed the day down 6.32% to $0.0365 on above average volume. In recent developments, Lithium Corporation. (OTCMKTS:LTUM) announced that it had officially signed a formal agreement for Fish Lake Valley Prospect. The terms of the agreement are quite detailed. The terms are listed at the bottom of this article as not to bore readers with the details. The CEO Brian Goss, Lithium Corporations president stated, “We are pleased to have executed the final agreement.” The company also recently announced results from trenching at BC Sugar. LTUM is an exploration stage mining company engaged in the identification, acquisition, and exploration of metals and minerals with a focus on lithium mineralization on properties located in Nevada, and graphite properties in British Columbia. Its current operational focus is to conduct exploration activities on the Fish Lake Valley property and San Emidio prospects in Nevada and the BC Sugar property in British Columbia. From a technical perspective, the stock is now trading above its 10 and 30 weekly moving averages which is a bullish indicator. An even more bullish indicator would have been if volume surged as well on the breakout above the moving averages. The stock could revisit its lows before getting said volumes to confirm a breakout. LTUM could be poised to surpass its 52-week highs and go to its highs that it hit last year $0.15 which would be more than triple its current price. 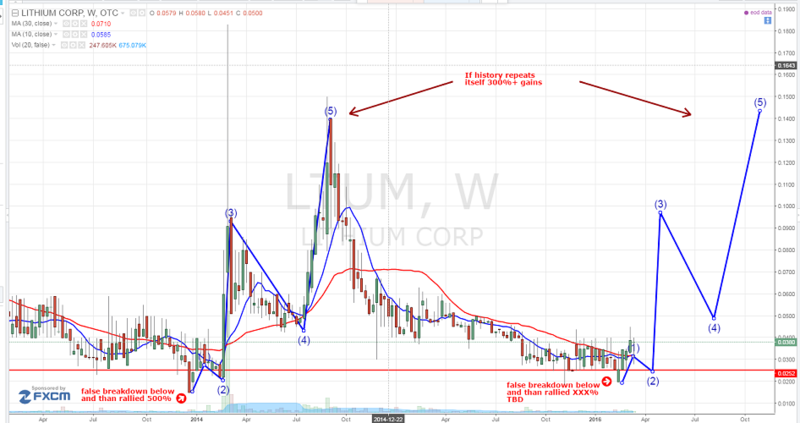 Time will tell if LTUM can create enough excitement. LTUM is currently trading at a $2.85 million market valuation. This company is slowly trying to find its way and attempt to breakout to new highs. LTUM recent new agreement could bring about the excitement and anticipation needed to launch the stock forward and gain momentum. Stay tuned as we will be updating investors soon. We will be updating on LTUM when more details emerge so make sure you are subscribed to Microcapspot so you know what’s going on with LTUM. Disclosure: we hold no position in LTUM either long or short at the publication of this article and we have not been compensated for this article.